A career counselling session was conducted on 18th December,2016 by KCM Career Hub for the current second year students regarding the scope and opportunities that lies ahead with the two specializations provided by KCM i.e Finance and Banking and Marketing. This event was held to help the students tackle the different future opportunities both the specialities hold and choose the one that suits them the best for their next semester. There were experienced speakers on different fields. 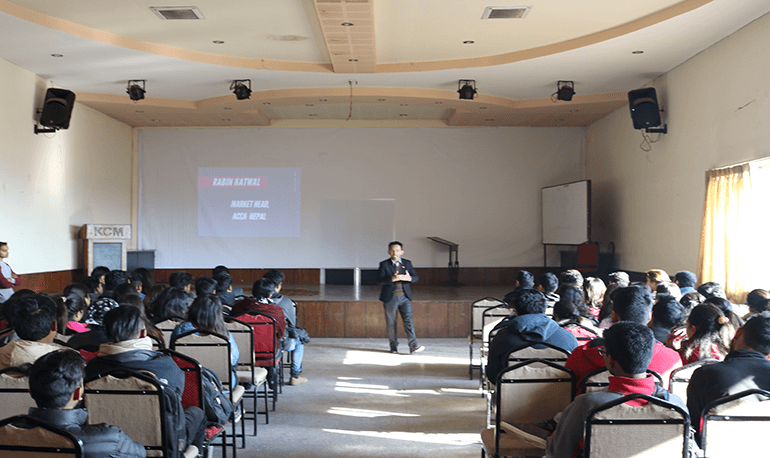 Mr. Prashant Pokharel, finance director of Inspire Group of Companies shared his experience as well as possibilities in the finance sector whereas Mr. Rabin Katwal, Marketing head of ACCA Nepal gave an insight in the marketing area. Similarly,Deeptangshu Thapa, Faculty of marketing in KCM and Mr. Jayant Agarwal, Managing director of Robbin Polymers shared their views in their respective sectors hoping to clear the confusion among the students regarding two different paths that lies ahead of them.